Registration for 2019 is Live! Ambassador registration for the 2019 Summer Sessions will open February 1, 2019. General registration for the 2019 Summer Sessions will open April 1, 2019. 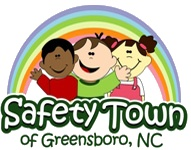 Safety Town is two-hour a day, two-week program for five (5) and six (6) year old children (not older, not younger) that teaches safety lessons on strangers, traffic, pedestrians, fire, bicycles, bus, poisons (including drugs), water and guns. This community service program has been sponsored by the Greensboro Police Department, the Nat Greene Kiwanis Club of Greensboro, and other area local civic and business organizations for over 39 years. Safety Town is fully accredited by the National Safety Town Center of Cleveland, Ohio and a staple for the design of other facilities around the country.